With winter in full swing, keeping warm can be a challenge - especially for creatures who aren't necessarily equipped for frigid conditions. 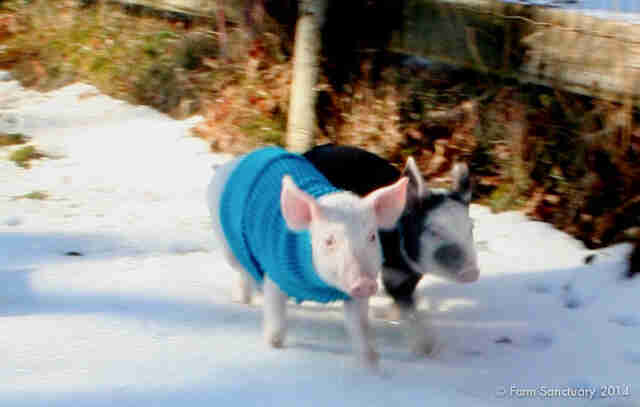 But the rescued animals at Farm Sanctuary in New York don't have to worry about catching a chill as they stroll about on a frosty day. 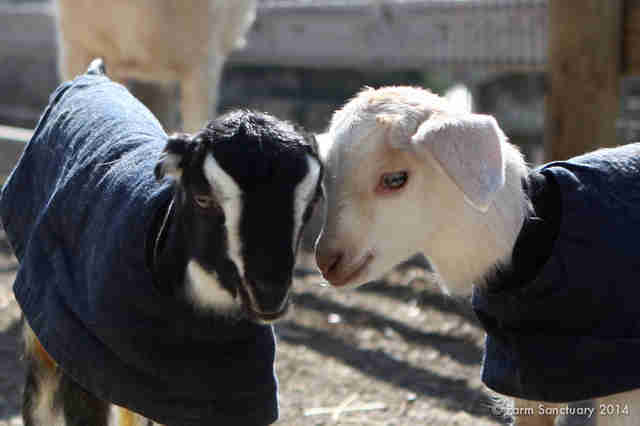 Instead of being cooped up inside when the mercury drops, the adorable residents there are given coats to stay warm as they stretch their legs. This sort of special consideration to ensure that animals are cared for and cozy is what Farm Sanctuary is all about. 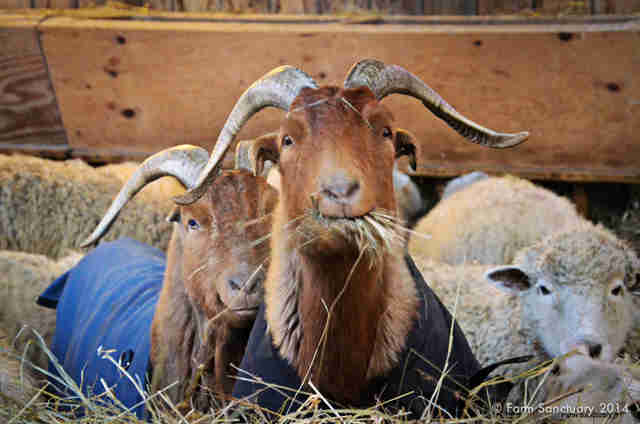 The 175-acres shelter in Watkins Glen, N.Y. is home to more than 500 rescued farm animals, many of whom were rescued from conditions where they were thought of as mere commodities, and little importance was given to their comfort. 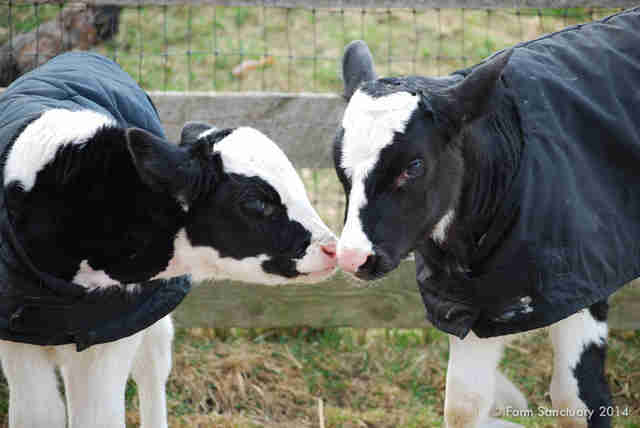 "When we rescue animals they are often underweight, sick, and stressed and need the extra layer to keep them warm in the winter," Farm Sanctuary staffer Krysta Vollbrecht tells The Dodo. "Sometimes we'll put them on the babies in the winter so they can go outside and get fresh air, run around, etc. Especially in the chilly upstate New York winters!" But the sanctuary's youngest residents aren't the only one's who stand to benefit from the added insulation that comes with a coat. "Because we do provide individual care, animals at sanctuary live to be much older than any farm that would keep them for production," says Vollbrecht. 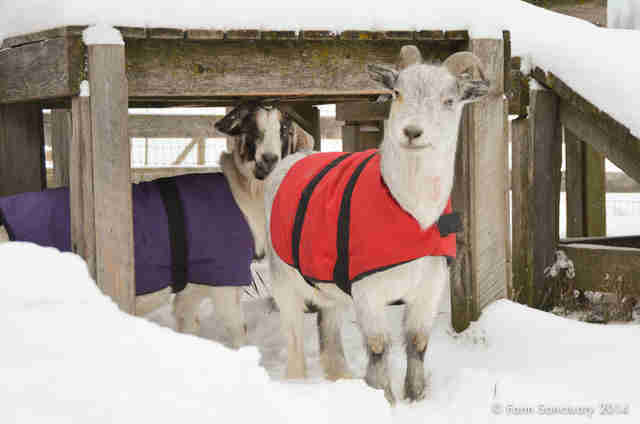 "Some of the older goats get coats because, like humans and dogs, as they get older they don't retain fat on their bodies as well. It keeps them comfortable in the cold." Not only is it a delightfully thoughtful solution to the cold weather conundrum, it's a heartwarming one as well. 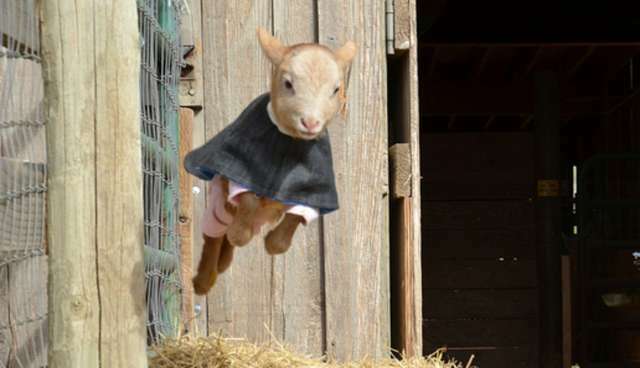 After all, what could be cuter than a goat in a coat? To learn more about Farm Sanctuary, and how you can help, visit their website here.